You may have noticed I haven’t joined in with the Bake Off for a few weeks (the last time was with my rainbow frangipane tart for which I received star baker!). First we moved house and then the following week my father-in-law passed away so I’ve had a lot going on, plus we have only just had internet installed so I’ve only had a mobile connection and haven’t even opened my laptop until yesterday. Anyhow, I really wanted to join in with chocolate week and after watching the show I immediately knew I was going to make a chocolate tart. Though I didn’t anticipate chocolate pastry not being as easy as normal pastry, which I’m not usually that great at anyway… I am so glad I’m not presenting this one to Paul & Mary as my pastry case is a mess! It’s cracked, bubbly, uneven… I will try it again at some point though as I will be determined to get it right. I had a couple of ideas for this before settling on including an ingredient you may have noticed in abundance in my recipes – peanut butter! 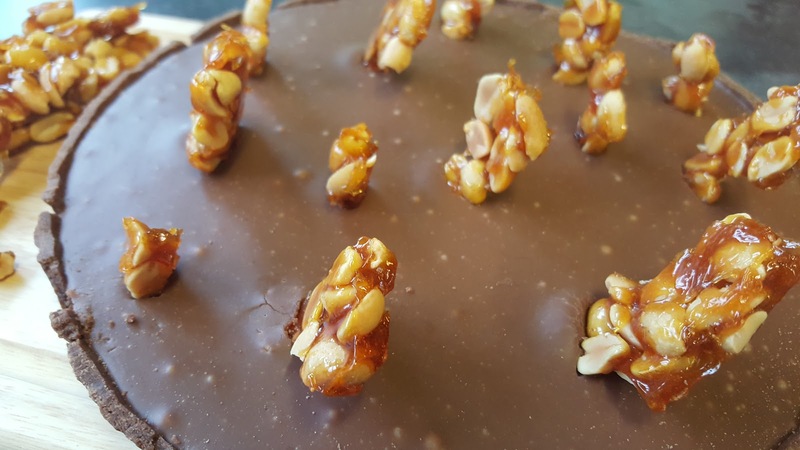 I can’t help it, I’m in love 😉 This tart has a crisp pastry case, with a smooth peanut butter ganache filling, topped with a smooth chocolate ganache, and then peanut brittle on top for a bit of crunch (the first time I’ve attempted that too!). Preheat oven to gas 6/200C/400F. For the pastry, sift the flour, icing sugar, and cocoa powder together, then add the butter and rub in lightly until the mixture looks like fine breadcrumbs. Mix the egg yolk with the water and use a knife to mix the liquid into the flour. (Alternatively you could do it in a food processor like I did!). When it begins to stick together, gently knead into a ball (remove from the food processor first if using), wrap in cling film and chill for at least 15 minutes. On a lightly floured surface roll out the pastry big enough to fit a 9 inch tart tin (with a removable base if you have one) making sure to leave some excess to allow for shrinkage. Line the pastry with baking paper and fill with baking beans or uncooked rice. Blind bake for 15 minutes then remove the paper and baking beans and bake for another 7 or 8 minutes. Leave to cool then trim away any excess pastry with a small sharp knife. 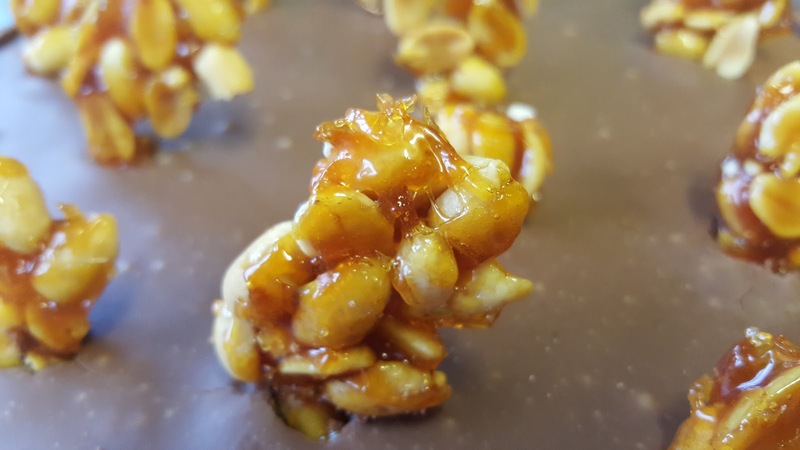 When cool, prepare the peanut butter ganache by gently heating the cream until bubbling, then add the white chocolate and stir until melted, then finally stir in the peanut butter until the mixture is smooth & creamy. Pour over the pastry base then chill until the ganache is set but still slightly soft to the touch. Prepare the chocolate ganache by gently heating the cream until bubbling, then add the milk chocolate and stir until melted and the mixture is smooth & creamy. Pour this mixture over the peanut butter ganache and again chill in the fridge. Prepare the peanut brittle by heating the caster sugar in a medium pan over a low heat. When it starts to melt gently shake the pan; at first it will clump together, then turn a light golden colour and eventually a dark caramel colour. At this point add the peanuts. Quickly pour the mixture on to a baking tray lined with baking paper, and leave to set but do not touch! Break into pieces and add to the top of the tart in some artistic way! 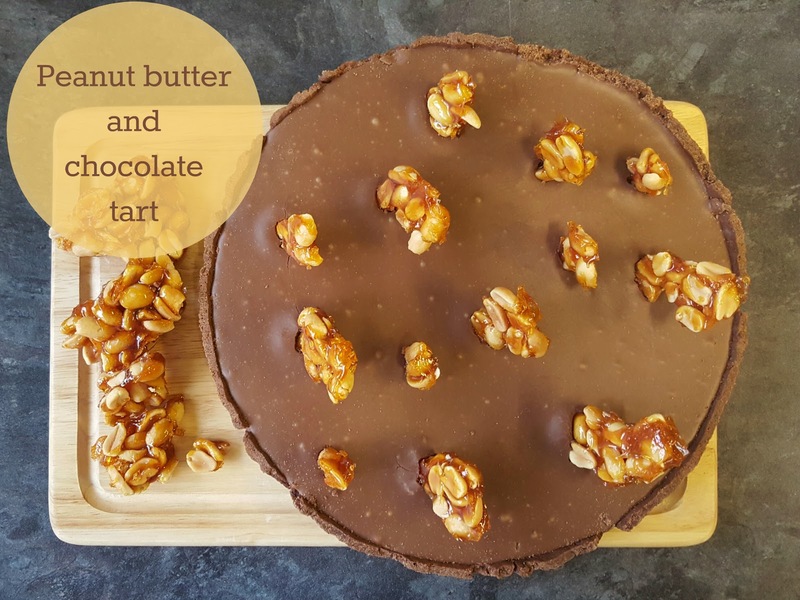 As usual, linking up with Jenny over at Mummy Mishaps and the host for this week, Baking Queen 74. It was so close to a Reese's, lol! Oh…it was more than heavenly, ha! I could have eaten the whole thing! The tart looks great and I'm sure it was delicious with all that peanut butter. Thank you, it really was delicious!